AcademicsSchoolsSchool of PharmacyOur NewsDuquesne University Magazine Features Article On Annual Advocacy Trip To Washington, D.C. 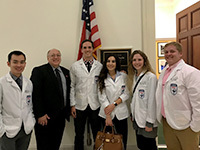 The Duquesne University Magazine Spring 2019 edition featured a story on the Annual Advocacy Trip to Washington, D.C. Every fall PY2 and PWY3 students visit Washington, D.C. to visit the U.S. Pharmacopeia and meet with legislators to advocate on behalf of the pharmacy profession. The Duquesne University School of Pharmacy is the only pharmacy school in the country to have an advocacy trip as a requirement for graduation.